Is this the iPhone 7? 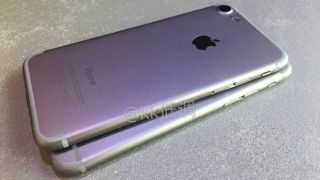 As September gets closer we're learning more and more about the iPhone 7 and the iPhone 7 Plus, and a new video leaked to Chinese social network Weibo purports to show the smaller of the upcoming handsets alongside the iPhone 6S from last year. There's no way of verifying the authenticity of this device but the 159-second clip does show a larger camera lens and a redesigned antenna layout, two rumours that we've heard in the past from a number of sources. The headphone jack has disappeared too, to be replaced by a second speaker grille. Apparently Apple may market this as a new stereo sound feature for blasting out your tunes without the aid of headphones. As you can see above, we get both front and back views of the iPhone, although our foreign language skills aren't good enough to be able to translate what the host is saying - if you can help out then please let us know. The Space Grey colour used in the past is again in evidence but from this video we can't tell anything about the inside of the phone. The usual speed and power bumps should be expected for 2016, and there's been strong talk of a memory boost to 3GB of RAM. The rumour is that the iPhone 7 Plus (which isn't shown in this video) will have an even better camera to help woo those who are serious about their smartphone photography. All will be revealed by Apple itself in just a couple of months.